A few days ago it was unbearably hot and humid out, but I was enjoying it nonetheless because this seemed to bring out all the ants and other bugs of interest. There were so many types of ants wondering all over my plants that I was tempted to make a video about them all but the mosquitoes got the better of me. 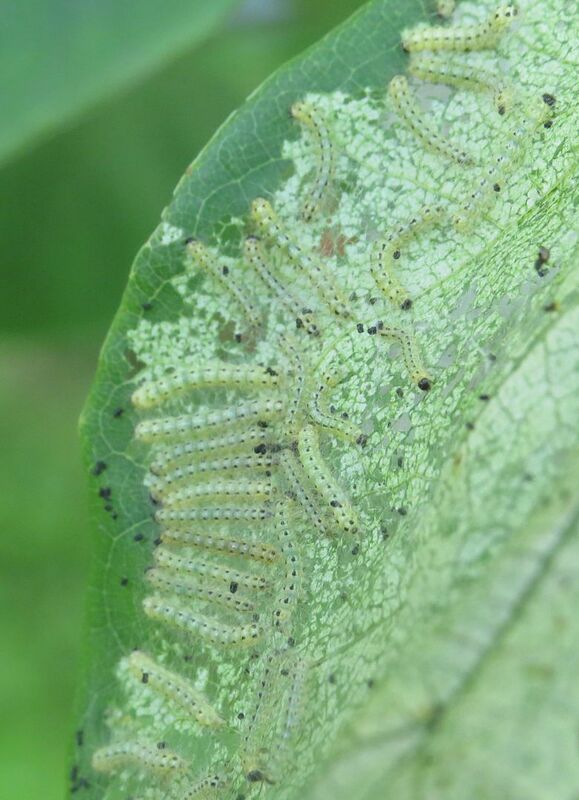 One thing I had to photograph was this patch of caterpillars on my Persimmon tree. My assumption was they were some type of giant silk moth but I don't believe that to be the case. Unfortunately they were all dead the next morning. No doubt a large black carpenter ant, Camponotus pennsylvanicus, came along and chewed them all up into mush as there were several of those out on the tree. The whole clutch of them could have fit on a quarter, they were that tiny. I'm kicking myself for not removing the leaf and placing them into the butterfly cage. I've no idea what they were, other than they were on Native Persimmon, they're were sort of hairy, and that I live in New Jersey. If anyone out there wants to take a crack at identifying them, be my guest. So I then realized this week, there are a lot of caterpillars in my yard! 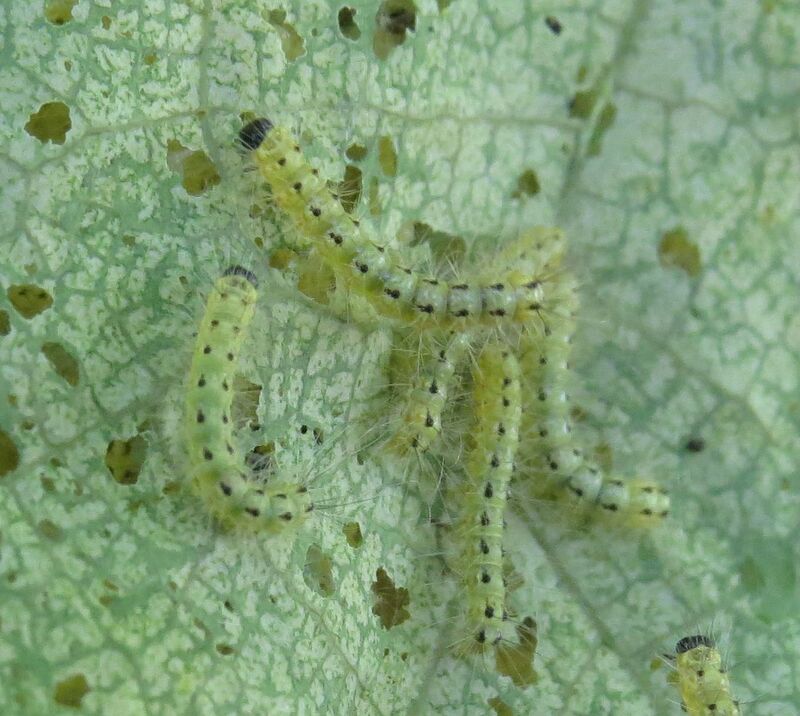 The Eastern Redbud has Fall Webworm, Hypantria cunea, which are poorly named because it's clearly the start of summer. 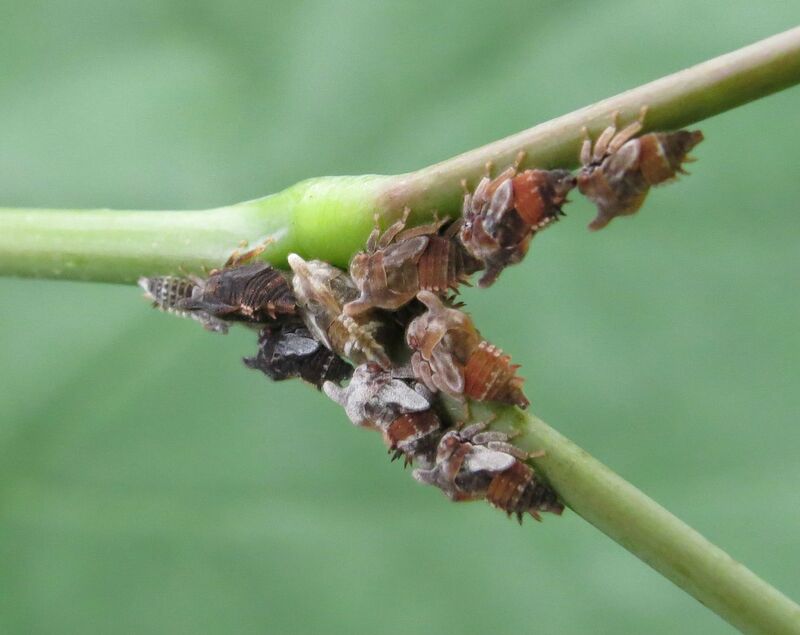 The tree also has treehoppers and a few aphids which are attracting ants that are supposed to help prevent insect herbivores or at least discourage and harass them onto other plants. It's not a perfect system but it does have an effect. 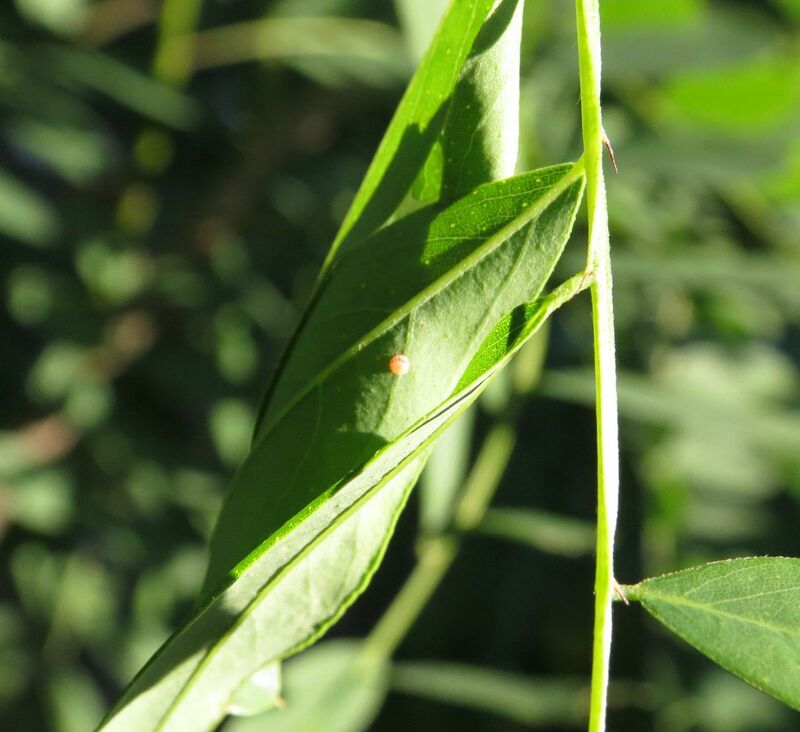 Fall Webworms get around this though by sticking together in a small group and forming webs around the leaves they eat for protection. They do this until they're big enough to take on a few ants or develop other defenses. I'm not sure what they are for this species but I know long hairs, tasting bad, chemical weaponry, are a small taste of what some caterpillars do for protection. 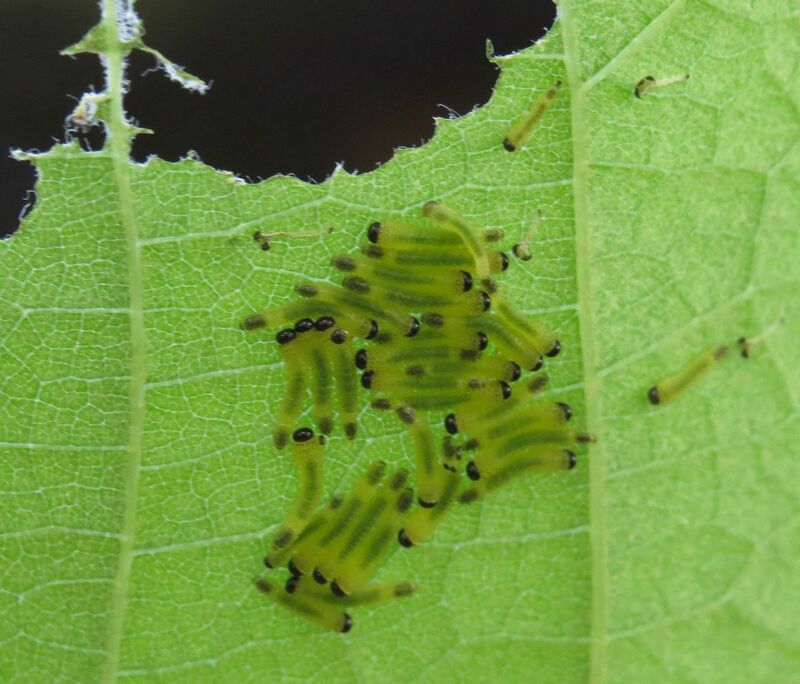 It's the early instars when the caterpillars have basically just hatched and don't have these defenses when they're picked off by everything, like the ones I found on the Persimmon tree. The Eight-Spotted Forester is a day-flying moth (not quite a butterfly) that hosts on grape vines. The adult has black wings and eight cream/white or pail blue spots on the wings, hence the name. 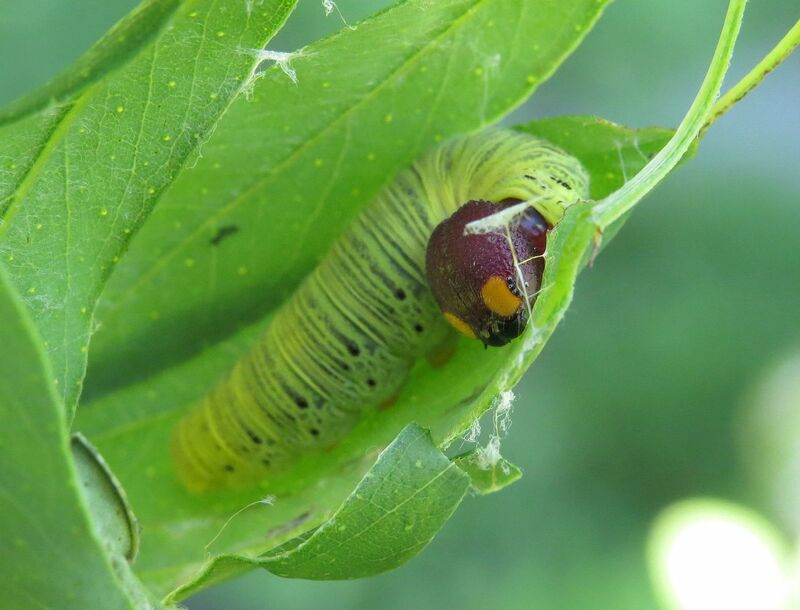 Caterpillars are somewhat colorful looking and are in the habit of jumping ship upon disturbance, often leaving a silk lasso behind so they can climb back up. Grape Vines are very aggressive growing and often the caterpillars don't effect the yield of the crop. Now I tried looking up what young Eight-Spotted Foresters look like, and I don't think these are them. What interests me is that the grape vine doesn't have any pores that produce extra floral nectar or attract aphids and other insects to do that for the plant. So that means the only ants walking over the plant are simply foraging for the sake of it, meaning fewer ants compared to a plant that's gushing out food to encourage them. So I'm curious to see how far these guys get. And lastly the False Indigo Bush, Amorpha fruticosa, has not only eggs but fully grown caterpillars on it. Silver Spotted Skippers, Epargyreus clarus, forage at night, making them hard to spot. During the day they stay inside a small "shed" of leaves they've woven together to hide from birds. 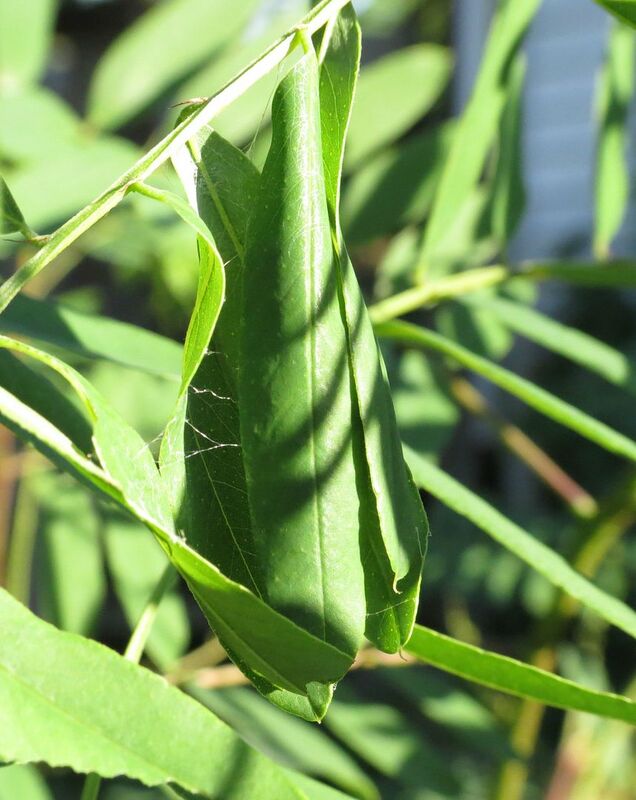 Smaller caterpillars simply chew a section of a single leaf and fold it over with silk. 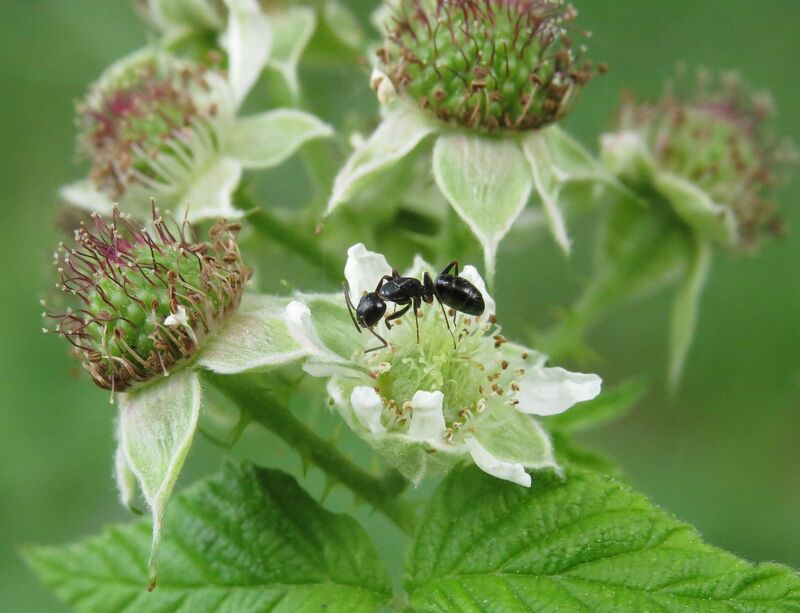 This is another case of the plant not attracting ants, other than letting them steal nectar from the flowers, but even this isn't a popular practice compared to other plants. 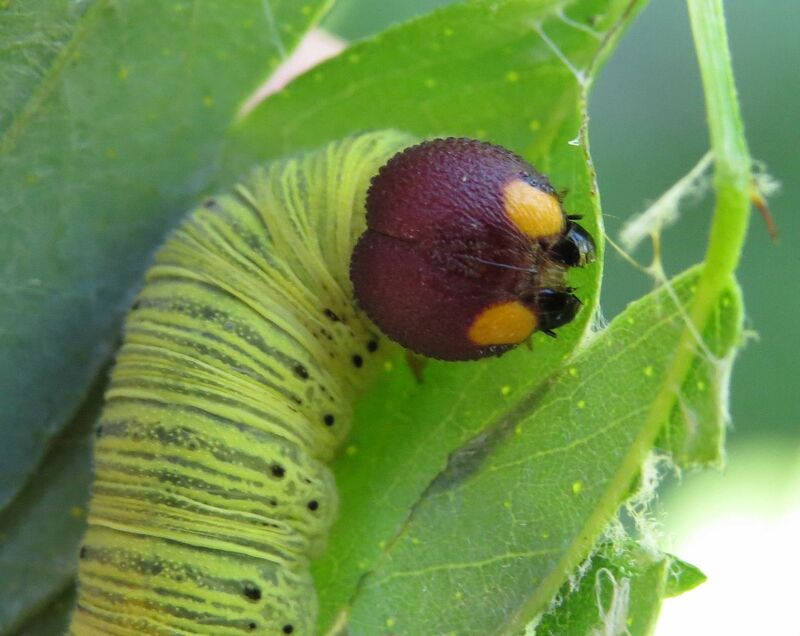 The caterpillars are a decent size and employ an additional tactic to hide from ants. One of the things ants look when hunting is insect frass; when they find it they know an insect can't be far. 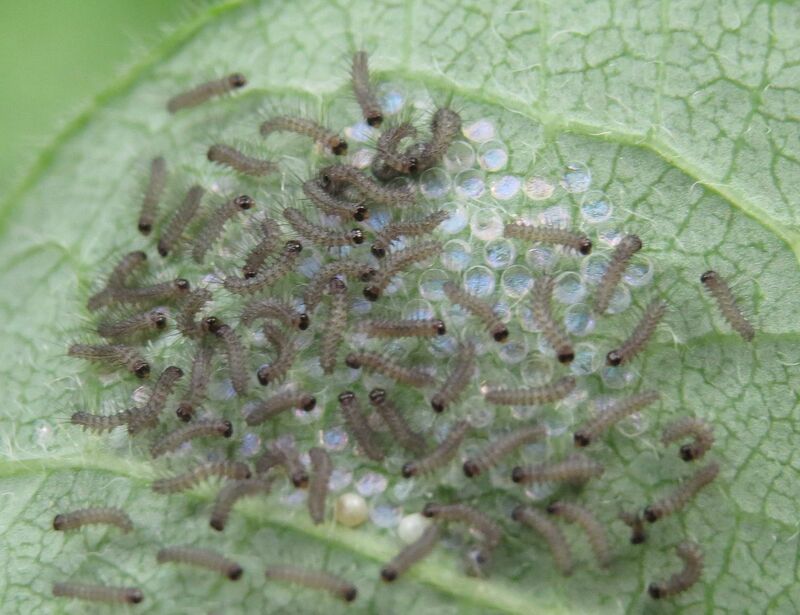 In this case though the caterpillars actually launch their frass pellets several feet away from them. They also lay silk down on just about everything they walk on to discourage ants from following them. Turkey Corn, Dicentra eximia, is a ... wildflower? I don't think it dies back technically until the autumn so it's not an ephemeral. The peak bloom is in the springtime though alongside the majority of our ephemerals in North America. 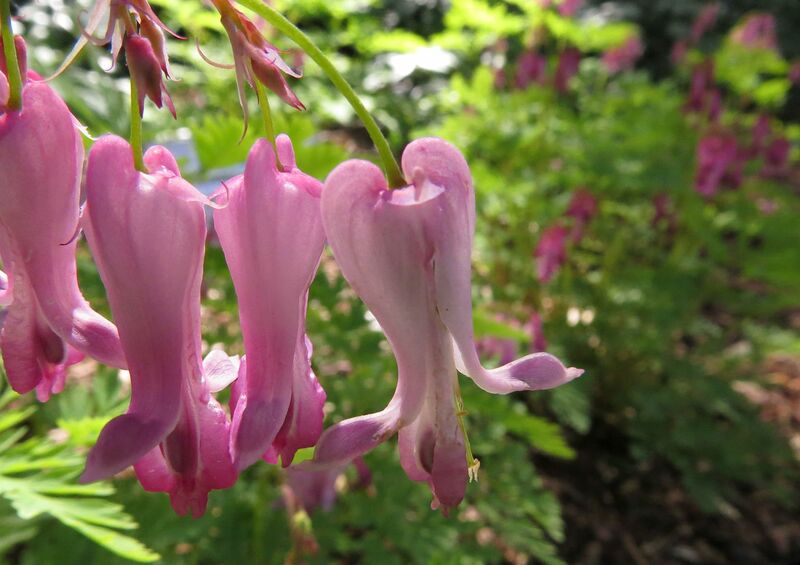 A lot of people mistake this for Bleeding Heart, Lamprocapnos spectabilis, but that's a different genus and it's not native; it's also more commonly sold by nurseries but both tend to be available if you look hard enough. Turkey Corn is better though because, despite the flowers not being as heart shaped, it actually blooms year round until it goes dormant in the autumn. Maybe 4 to 6 weeks after flowering seed pods will form on some of the blooms. Oddly enough though I've never seen any pollinators tending to the flowers so perhaps nocturnal moths are what it attracts? 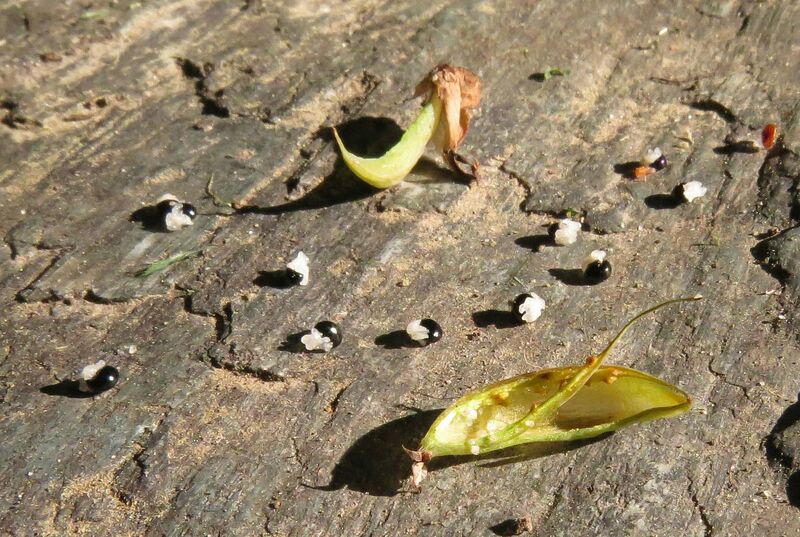 Seeds are tiny black beads with packets of elaiosome on them. Elaiosome is a lipid rich substance that ants find irresistible. Nutritionally speaking, it has more in common with a dead insect than nectar or honey, thus the ant thinks it's just found a dead bug, or eggs. It's been found that this substance effects the caste system within the colony. Some species will produce more new queens while others produce more workers over reproductive. So colonies will either go bigger or spread faster depending on which ant we're talking here. Both can benefit the plant in the long run. A bigger colony will plant more seeds in a central location; colonies also move and change location every year or two thus multiple patches are planted over the years. New queens produce more colonies overall so the seeds from one patch of plants can be taken in multiple directions potentially. About a month ago all the dogwoods were flowering, and while people are very familiar with the main two Cornus florida and Cornus kousa (not native) I've never really been impressed by the attention they get by bees. These are the big flowering dogwoods with the really big white "petals" which are actually bracks, modified leaves that are white or pink colored to act like flower petals. But unlike flower petals, they're able to produce chlorophyll to a degree where as true petals and rays do not. Pictured above is the Alternate Leaf Dogwood, Cornus alternifolia. This species lacks the big showy white bracks of its cousin and instead easily produces ten times more flowers! 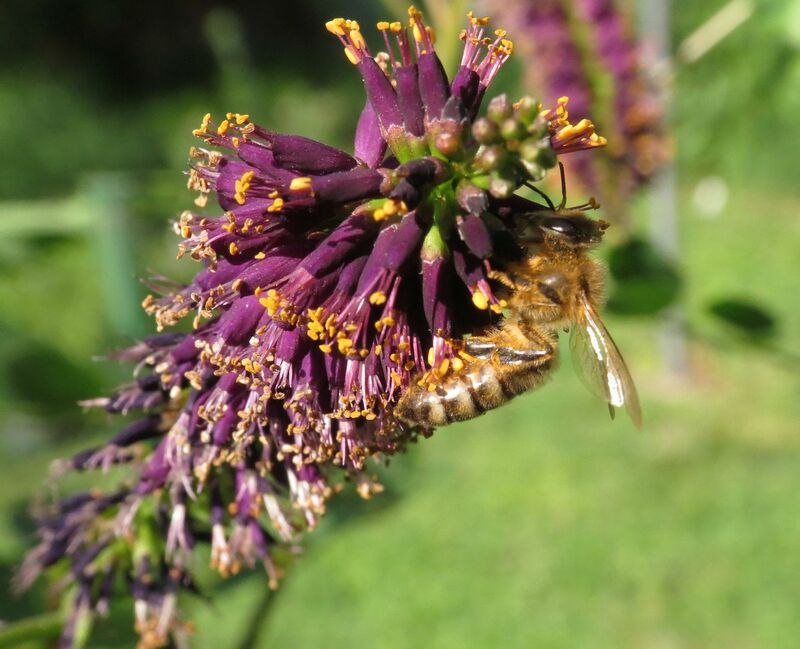 This makes them extremely popular with pollinators, and honeybees are no exception. One failing though is I believe the plant is only used for pollen (or otherwise produces an insignificant amount of nectar for bees to bother with) but it's certainly a powerhouse at doing so. 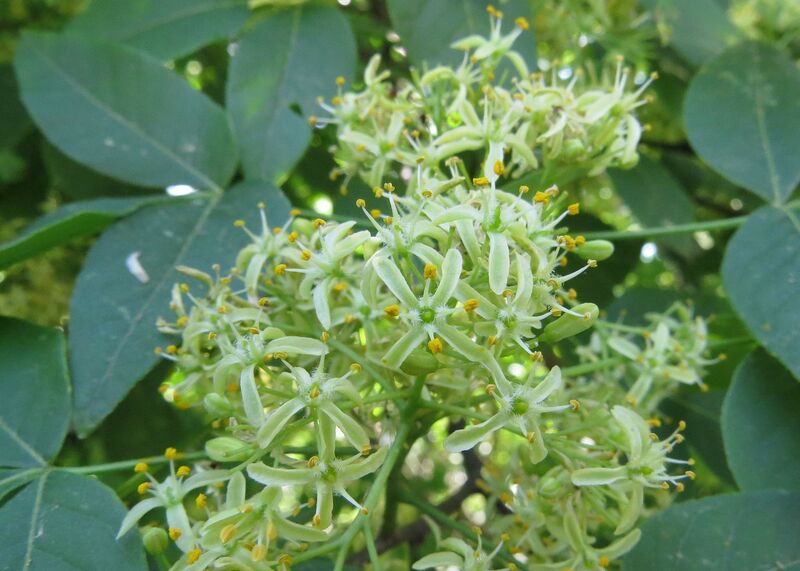 Growers will be impressed with the flowering display of saplings and every year they become more and more showy. Other dogwoods, such as the Red Twig Dogwood, Cornus sericea, take on more of a shrub habit. They have similar flower displays to C. alternifolia but nowhere near the amount of flowers, and thus have to grow considerably larger to get the same pollinator attention. 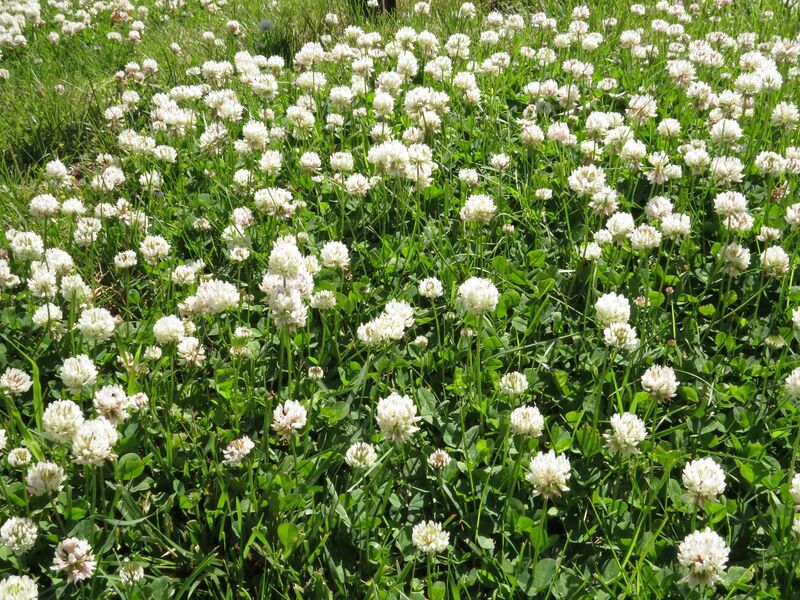 White Dutch Clover, Trifolium repens, this is a common lawn "weed" that I'm all for planting. It's hard to remain a native plant purest with a plant that spices up the nonnative American lawn. You can buy seeds to this plant by the pound which have about a 40% success rate when seeded into an established lawn. Plants produce their own fertilizer too and are fairly hardy. 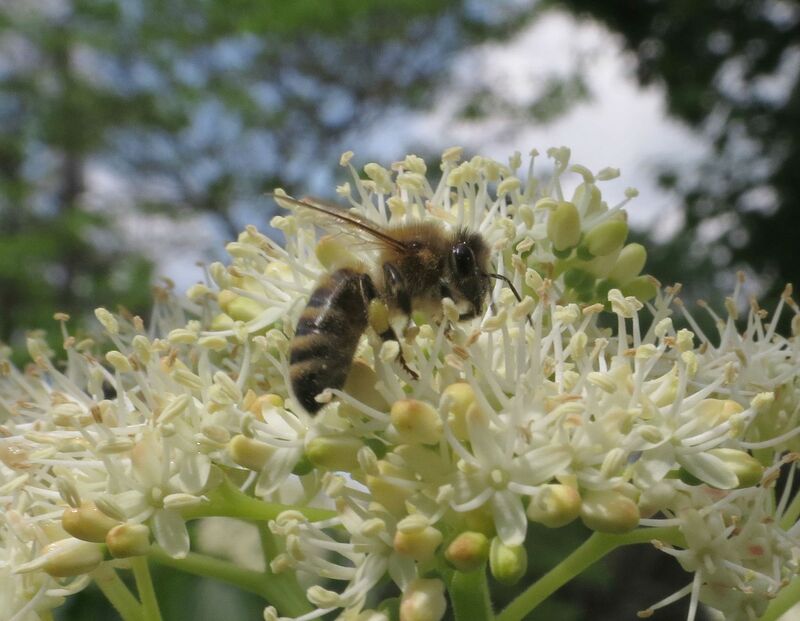 Even with large patches of this plant in bloom though you only see a hand full of bees even bothering with them. What makes them so successful as a nectar plant though is the fact that almost every lawn has them. Black Cherry, Prunus serotina. Truth be told, this isn't a very popular plant with any pollinators, but it's bloom time, along with other cherry/plums, fills a gap between a few others. It's also a host plant for the Tiger Swallowtail Butterfly, the berries are edible though perhaps better used for pies and jam making, or left to the birds as it's one of the earliest to ripen. 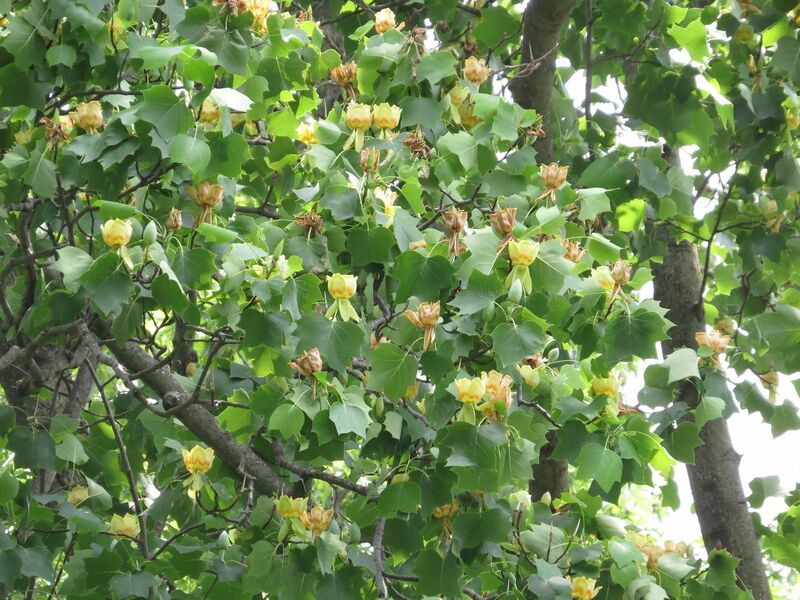 Tulip Tree, Liriodendron tulipifera. Not to be confused with Magnolias, this is one of the fastest growing and tallest trees in the forest. 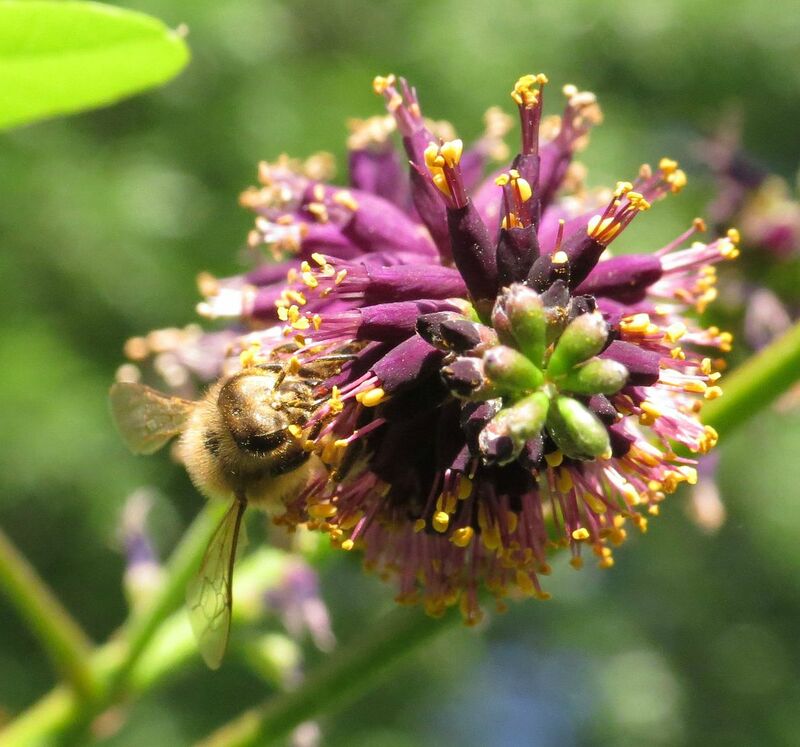 A dozen or so honeybees can work a single flower at a time, though it's not every year that it's flowers are prized. 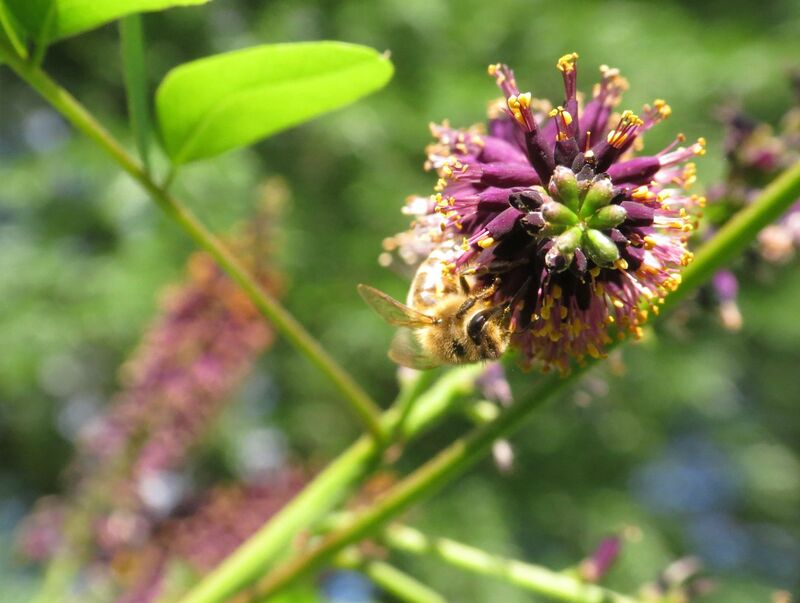 As odd as it sounds, honeybees will only work this tree intensely on years when the blooming is later than usual but also preceded by a rain storm. Rain causes most trees to produce three times as much nectar so on wet years a hive will produce a lot more honey. This tree is also a host plant for Tiger Swallowtails, so it's well worth planting if you've got the space. Hop Tree, Ptelea trifoliata. This tree has become somewhat uncommon which is a shame because bees go nuts for it. The foliage superficially resembles poison ivy, and can have a displeasing odor when disturbed. They can grow in full shade or full sun, but of course flower best in full sun. Also I've noticed that bees only work the flowers that are in full sun, often high up in the tree. (I would have gotten pictures of honeybees on this one but this isn't my tree and I didn't have a ladder accessible.) Another trait one might be on the fence about; this is the host plant to the Giant Swallowtail Butterfly, which is the largest butterfly in North America. 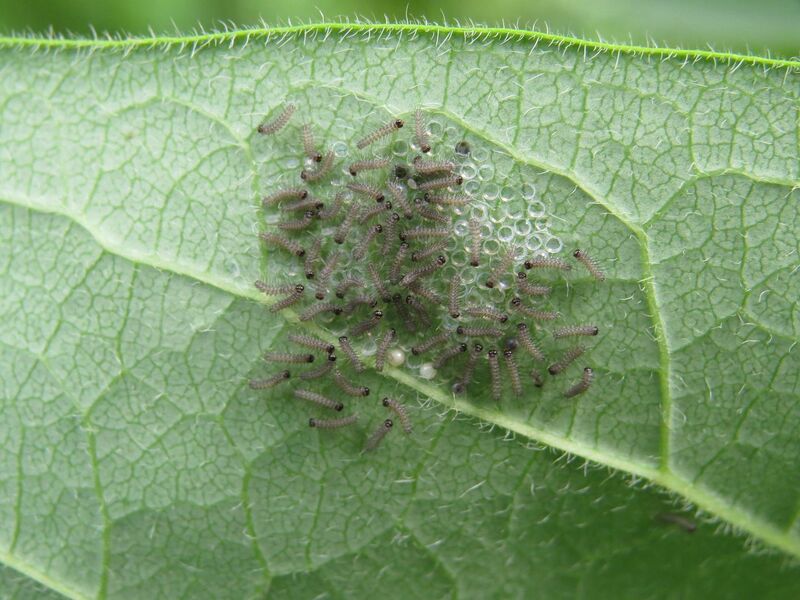 The caterpillars mimic bird droppings and have been known to completely defoliate whole shrubs and trees of this plant! So gardeners need to choose between a good nectar plant (assuming it's in full sun) or living with flocks of the largest butterfly in North America flying through their yard. Okay that's an ant, not a bee, but even they like to steal the nectar from some of these plants. Members of the Ribes genus are high up on the pollinator list. Red Raspberries in particular are beloved by honeybees but only when allowed to grow into a nice sized patch. Blackberries get a silver medal, maybe bronze compared to the classic Red Raspberries but are still worth growing. Spiderwort, Tradescantia sp., these only open in the daylight hours, and are usually closed by 4:00pm. 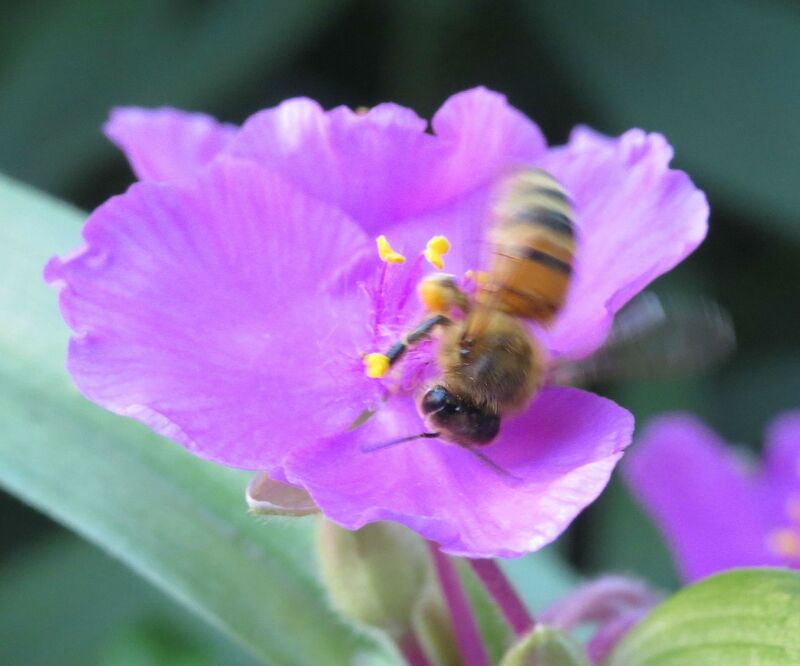 Honeybees work them, usually before noon time when the pollen is fresh. Patches of this plant need to be at least two feet around in order for honeybees to bother with them though. I planted a few dozen plants three years ago and it's taken that long for them to even take notice. Thankfully spiderwort is one of those care free natives that grows, spreads, and goes dormant with almost no maintenance or care. Black Locust is another one that's flowering now. 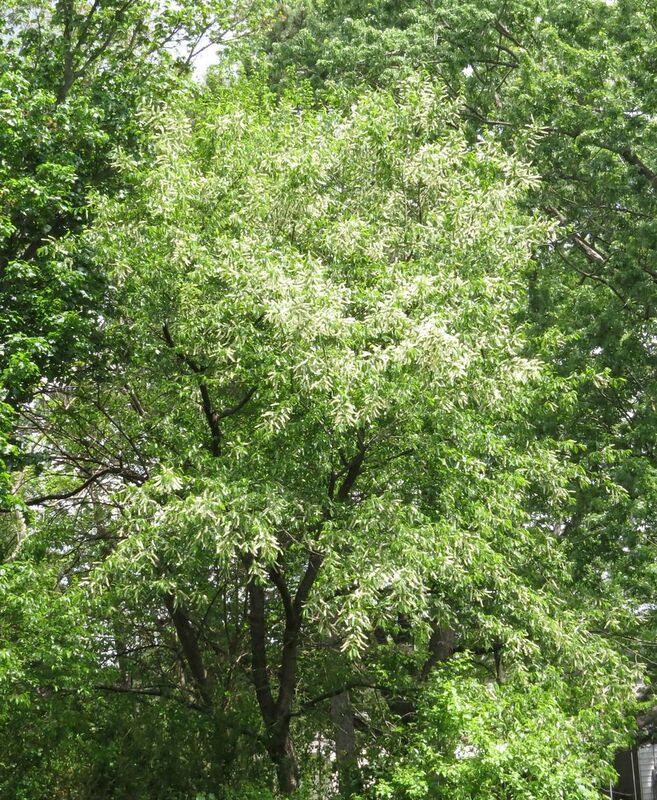 It's a medium sized tree with chains of white, wisteria-like flowers on it. I've been unable to find time to get pictures of it so far. The same goes for Catalpa Trees which are also flowering, and have great big white trumpets for blooms. False Indigo Shrub, Amorpha fruicosa, this is another one that's not often planted. The flowers are fragrant, plum colored with bright orange pollen, and appear similar to Butterfly Bush, but better smelling and with an open habit. This is another nitrogen fixing plants that produces its own fertilizer. It produces part shade beneath it too so you can grow it fairly close to a vegetable garden with little impact on the crops below. It's also a host plant for the Silver Stripe Skipper, the largest of the skippers of North America. 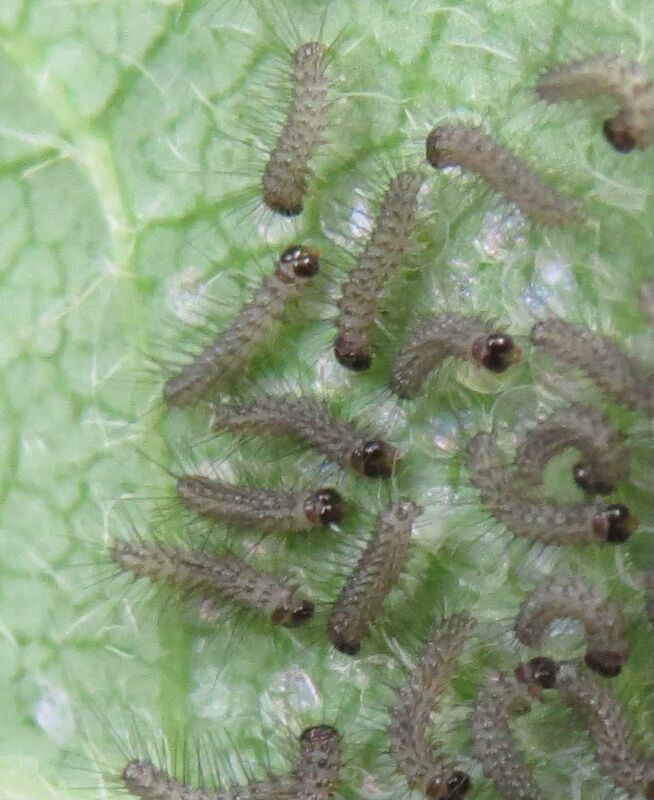 Unlike other supposed host plants of that butterfly, I've actually found the caterpillars on the plant! And a reminder that I wrote a book titled "Native Plants for Honeybees" last year on that topic. Word of warning, it's self published, and thus not on the best quality of paper. I encourage you to give the free preview a try before commuting to purchase. Reading through some of the negative reviews I see not everyone thinks my opinion on plants was worth their time, also one seemed against self published in general.